This is one of the best appetizers I had in a long time and we basically stumbled upon it by trying to empty out our pantry. What we had to begin with was old whole-grain bread and overripe tomatoes and what we ended up with was amazing and so simple. – Preheat the oven to 210°. – Press the cloves of garlic into the olive oil. Add the finely sliced herbs (in this case we used chive) and a touch of salt. – Cut the tomatoes in about 1.5 centimeter thick slices. 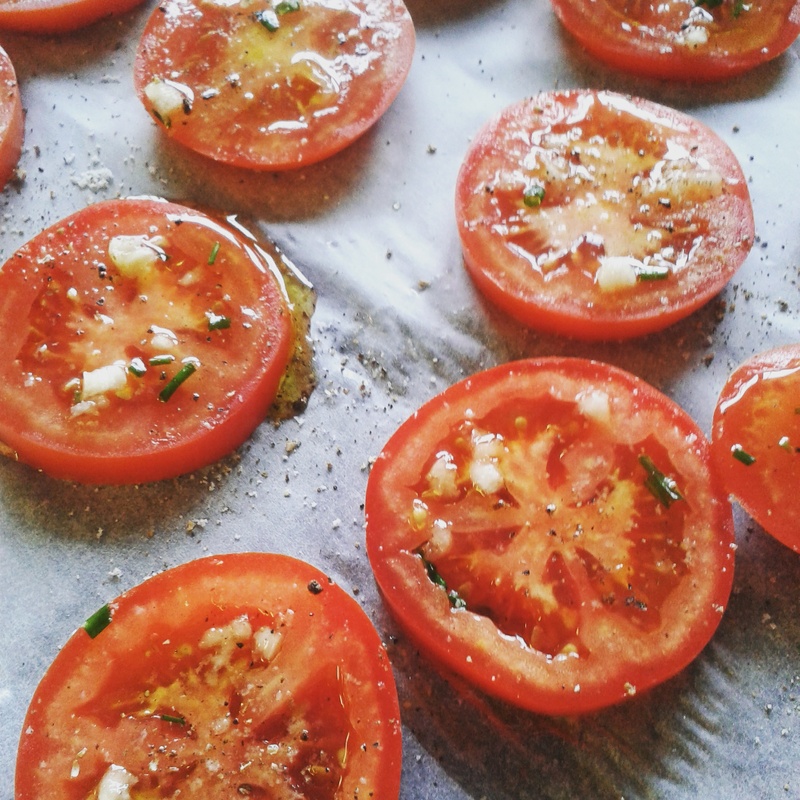 Put them onto a baking parchment and pour about half of the garlic-olive oil onto the cut surface of the tomatoes. – Insert the tomatoes into the oven and let them bake for about 10 minutes (until the edges are a bit brown). – While the tomatoes are in the oven, cut the bread into 4 large pieces and cut them into halves if you want to. Put them on another baking parchment and add the rest of the oil. When the tomatoes are done, put the bread into the oven (upper half) and let it roast for about 5 minutes. 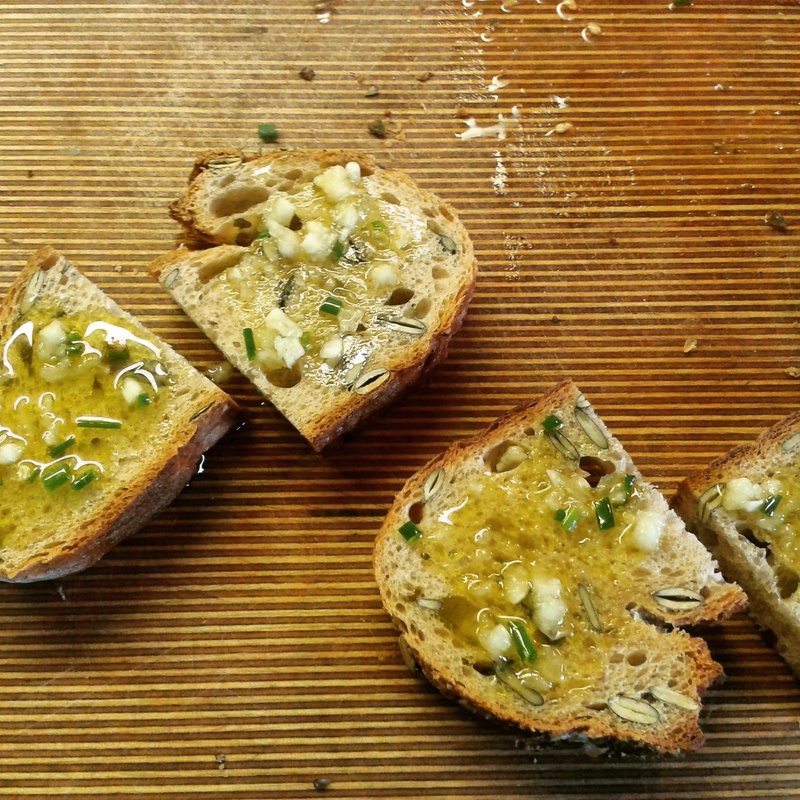 Bread topped with olive oil, garlic and herbs. – Afterwards, take out the bread and spread the cream cheese (optional) on the warm surface. Top it with the still warm tomatoes and some rucola and voilà – your appetizer is ready. It just looks like the tomato bruschetta ….yummy n full of love… 🙂 love Alan . THANK YOU! I have an overabundance of tomatoes and this looks just lovely. Going to harvest a few for tonight! Yummy~ This is my kind of food.., so healthy and easy to make! Thank you! Hi Foodislove, thanks for your like. Great photos!